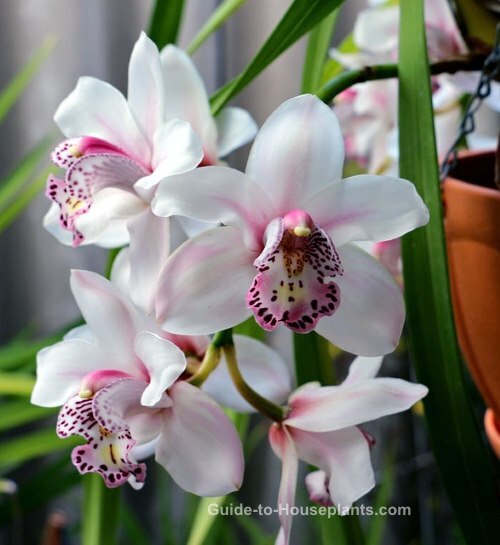 Cymbidium orchid plants are among the easiest to grow indoors. 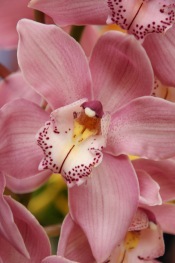 Don't treat them like Phalaenopsis orchids -- Cymbidiums need more sunlight and cooler temps. Cymbidiums grow clumps of fat, stem-like pseudobulbs that emerge from rhizomes. Long, leathery leaves surround the pseudobulbs, arching outward. For several weeks in winter or spring, sprays of long-lasting flowers open along the length of the upright stalk. Flowers are available in pink, white, red, green and yellow. The easiest way to identify Cymbidium flowers is the contrasting 3-lobed center with a spotted lip. 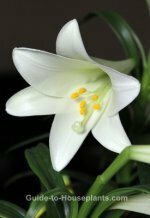 With plenty of light, Cymbidiums flower abundantly in winter and early spring. Shed some light. Put your cymbidium orchid plants where they'll get plenty of light. If you don't have a spot near a window, fluorescent lighting works beautifully. Use 1 warm white tube and 1 cool white tube under a reflector. Place orchids about 8 inches (20 cm) beneath the light for 14-16 hours a day. It's also important to give them darkness at night. Orchids need a rest, too. Without question, orchids love humidity. If relative humidity drops below 50%, use a humidity tray or room humidifier to increase the moisture in the air. 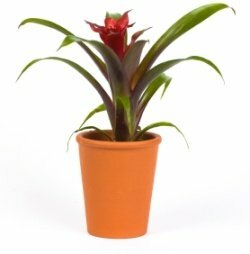 Grouping plants also helps to maintain the humidity around them. Give it some air. Giving your cymbidium orchids plenty of air circulation will help to prevent fungus. Place orchids where they'll enjoy free-flowing air, away from heat or AC vents. To repot...or not. The main ingredient in orchid potting mix is fir bark, which breaks down after a couple years and needs replaced. 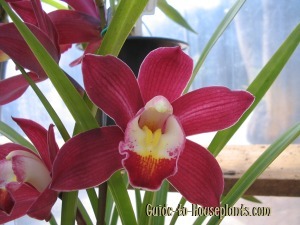 Cymbidiums bloom best when slightly pot-bound, so you can keep them in the same container or go 1 size up. The best time for cymbidium orchid repotting is in summer, after it stops blooming. Give it a rest. Cymbidium orchid plants need cool temperatures to trigger flower buds. Give them 6 weeks of cool (45-50°F/7-10°C) temperatures in late fall. Cut back on watering during this cool rest, keeping the medium only lightly moist. After that, you can move your orchid back to its usual location. The Orchidaceae family is the biggest in the plant kingdom, boasting more than 30,000 species. You'll find Cymbidium orchids for sale in the winter and spring, when they're in bloom. Thousands of hybrids are available. Miniature cymbidium orchids hybrids tolerate the warmth of heated homes better than most. Choose an orchid with plenty of unopened buds and you'll enjoy several weeks of blooms. Height: Species vary widely -- many range from 12-30 in (30-75 cm). Taller orchids may need staking. Light: Bright indirect light year-round. Some direct sun in winter is fine. Water: Keep soil evenly moist from spring through summer. Cut back on watering during the cool period in fall. In winter, water just enough to prevent the soil from drying out. Temperature: Average room temperatures (60-75°F/15-24°C), except for a cool period in fall (45-50°F/7-10°C) to set buds. Fertilizer: Feed every 2 weeks with an orchid fertilizer in spring and summer. Don't feed while orchid is resting. Propagation: Division. Divide mature plants immediately after flowering by cutting the rhizome with a sharp knife. Each piece should have at least 2 pseudobulb shoots and some roots attached.